All the businesses that are dotty about developing and expanding their boundaries on a global level use Google Adwords as an extremely useful online marketing option; however, the features of AdWords are specific accordingly businesses and a lot of hard work has to be put in to find out exactly how it will work for a particular business. How long before results are expected? Can effectiveness be measured? And how? The purpose of Adwords needs to be understood up front; the search engine provides the free software to manage online advertising campaigns using the Pay-per-Click (PPC) model. In this method, a business pays for the service only when their ads are clicked and the search results displayed on Google Ads. Most businesses are willing to try PPC, but they do not continue with sustained efforts as budgets are depleted quickly and results are not on expected lines. Putting together a paid campaign for search, funding the campaign and sitting back to watch traffic converge on the website is a situation that is far from reality. For a PPC campaign to work successfully and provide rewards, it is first essential to have extensive knowledge of Adwords usage and testing because even the slightest changes can have huge impacts on overall results and performance. Reflect a good landing page layout etc. Google has created a win-win situation where they will make money from well-placed ads while the business gets valuable leads that are likely to convert into definite sales. Google AdWords and PPC (pay-per-click) squarely beat other forms of advertising and marketing such as social media, search engine, printed media, digital media. Reason being that the implications of interactions can be followed in terms of how often they were displayed, numbers clicked, when they were clicked, where they were clicked, what actions came pursuant to that and so many more. Graphs and time scales compare and make results more transparent with figures and metrics, suggestions for improvements. By using hundreds of variations in features, campaigns can be customized; keywords and ad groups can be optimized to achieve relevancy in online searches resulting in more leads. Flexibility assures below prime activities; these features provide an approach to targeting which is precise, leads to increased conversions, improves ROI, and saves considerable money. Keyword Matches: Seeing how ads are controlled when related queries are searched. See the different kinds of keyword matching options to trigger your ads. Ad Scheduling: Choosing when and where ads are shown; bidding lower during low traffic and raising them as traffic increases. 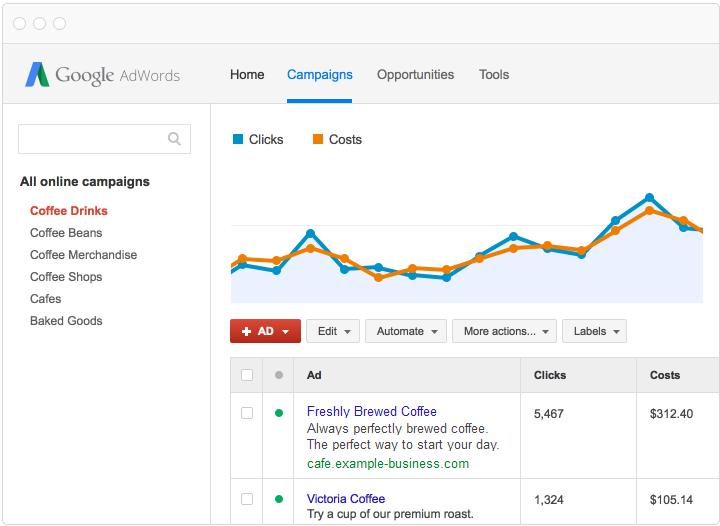 Increase your bid for high visibility of your ads during working days that will improve your performance in Google Adwords. Display Network Targeting: Allows greater exposure for related websites displaying Adsense ads. Your ads will be appearing on websites and web pages that you can easily target your audience and reach the customers using Google Display Network. Location Targeting: Creating specific ads, campaigns and keywords for specific locations: countries, areas within a country, a radius around a location, or location groups. As a result, Geo-Targeting focuses areas of advertising and increases your return on investment. Even the slightest changes in campaigns can be tracked instantly, which means that these changes can be judged well, to bring about better impressions and more valued customers. Since these changes show their impact on real-time advertisements, the effectiveness of keywords can be tested and evaluated on a regular basis. This way, throughout the campaign the ads can be monitored, changes implemented and a win-win situation created. The priority of Google search engine is to find ads of the highest quality that closely match the keyword searches. Hence, constant improvement of PPC ads is necessary to attract customers; Ads extensions encourage searchers to interact more and more with businesses. Social media sites have a tremendous impact on the advertising and promotional activities of businesses. A process of ‘Remarketing’ enables the PPC ads to keep track of people who have accessed the website through any of the links to ads placed on web pages; as they go on the Internet, their movements are tracked. “Remarketing” brings greater profits and superb ROI. We know now that the results of moneymaking efforts through Google AdWords are measurable quickly, almost in real time, using simple tools and comparison graphs to catch the highs and lows of traffic. No matter whether the business is a large or a small one, adopting AdWords can bring marvelous ROI results, which demonstrate that this is an extremely result oriented marketing method. Affinity Audiences – One of the best ways to reach potential customers and making them aware of business needs – extension of media ads to online sales. Custom Affinity Audiences – Specific groups of people within categories – e.g. a sports shoe company may want to specifically ‘marathon runners’ instead of just ‘athletes’. By creating content, that appeals a core group of people that is likely to browse content about specific themes relating to marathons. In-market Audiences – To find customers who most likely research products or brands and considering active buying; this is likely to be the core of the ‘purchasing group’. Most businesses today have realized the importance of being business savvy on the Internet. Online marketing is considered the best form of advertising and marketing that not only small businesses, but also even large ones can ably and deftly use to garner quick results. Brand concept, imagery, corporate information, product information, customer reviews, all of these contribute to greater interaction between buyer and seller. It has become a necessity for every business to have a web presence because competition is extremely tough and any business that has not kept consumer in mind is likely to be off the radar completely.